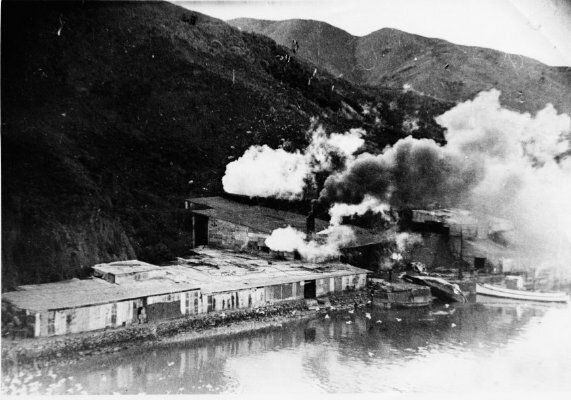 Description A black and white photograph showing Perano's Whaling Station in Fishing Bay (Whekenui Bay)* [see below] Tory Channel, Queen Charlotte Sound in 1956. Information as typed by Norm Brayshaw: "Whaling. Messrs J.A. Perano's whaling station on the northern side of Tory Channel as at 1956. Copied in 1959 by Norm Brayshaw from an original photograph supplied by Mr. Max Kenny, Blenheim. Includes a negative. J.A. Perano's whaling station at Fishing Bay on the north side of Tory Channel in 1956. A captured whale is being hauled up the slipway at right. Obviously another whale has been caught of late and its blubber is being processed, judging by the steam coming from the blubber digesters at left. The dark smoke could be from the steam boiler driving the machinery. When everything of value had been stripped from the whale, the carcase was pulled back into the sea, and floated out on the tide. This Fishing Bay station started in 1924. *Marlborough Times, Wednesday, May 10, 1995, Ken Berry article titled, Whale factory manager reminisces. Cairo Huntley is answering Ken Berry's questions. "I first went down to Fishing Bay to work when I was 14. Fishing Bay? That's what we always called it, although it's marked "Whekenui" on the map. That's even closer to Cook Strait than the original whaling station at Te Awaiti isn't it? Yes. But you have to remember that "Tar White" - as the old whalers used to call Te Awaiti - had long gone by the time the Peranoes set up the whaling station at Fishing Bay."